This is my easy recipe for curtido de cebolla y tomate or onion and tomato curtido salsa/salad. 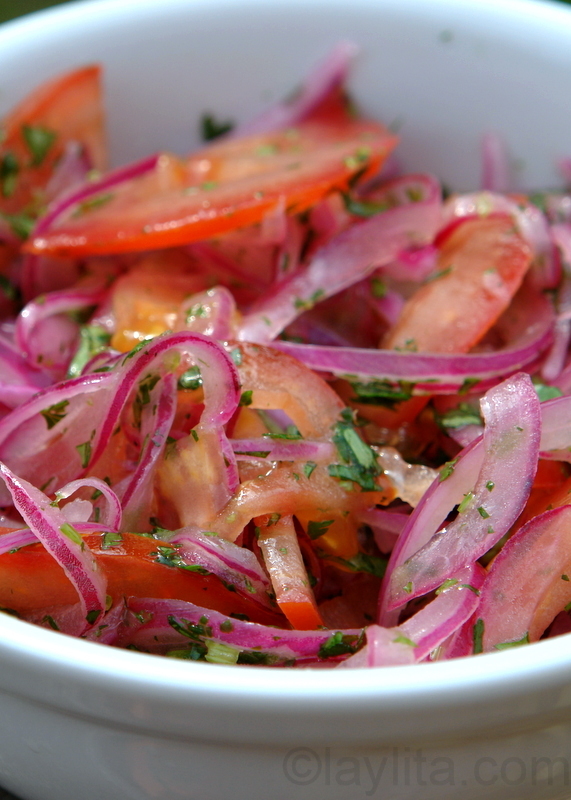 Curtido is a Latin style lime pickled red onion and tomato salad or lime marinated onion tomato salsa. Most South American main meals will be served with a small salad, and many times this salad will be a curtido or a lime marinated based salsa. 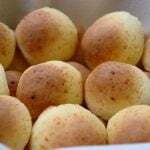 The most basic form of curtido is a basic onion curtido or cebollas encurtidas, it is great nice and fresh, but sometimes it is even better the day after. I usually make a large batch and keep in the fridge, adding it to salads as needed. Mix the onions with the sliced tomatoes, oil, and cilantro. Taste and add salt if necessary. Curtido variations can also include thinly sliced carrots, bell peppers, cucumbers, radishes, etc. To turn this curtido into a complete salad, serve over chopped lettuce or salad greens and add avocado slices. 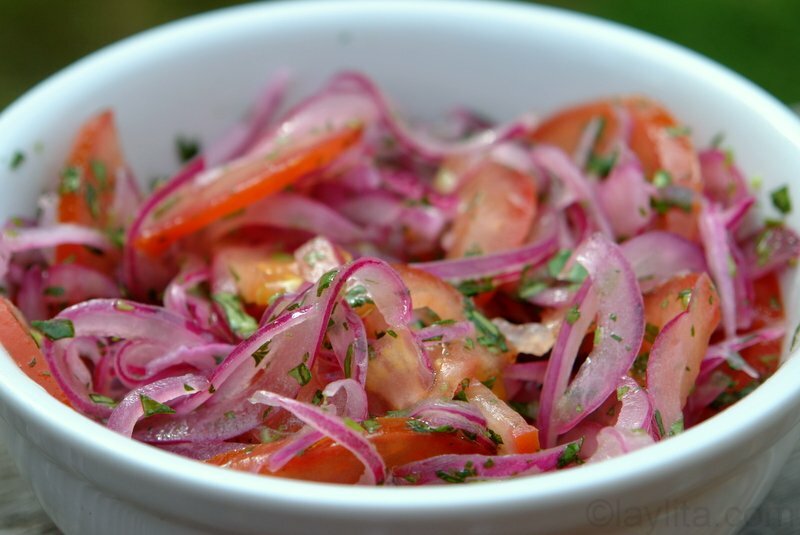 This variation of curtido or salsa is made with of red onion and tomato. 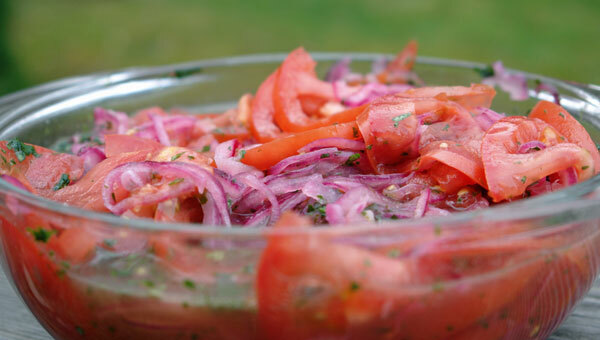 The onions and tomatoes are sliced thinly and marinated with lime juice and cilantro. In Ecuador, this salsa is a must-have side for traditional dishes such as hornado or roasted pork, encebollado de pescado, fritada, menestra con arroz, carne colorada, etc. This onion tomato salsa is also great as an appetizer or snack paired with plantain chips or with regular corn chips. Other popular curtido variations can also include different thinly sliced vegetables, such as carrots, bell peppers, cucumbers, radishes, etc – most curtidos will at least have lime marinaated onions plus another vegetable/fruit. This tomato and onion curtido recipe is also a great base for a salad: simply add lettuce or salad greens, avocado slices, maybe some grilled shrimp and you have a wonderful salad. Hi Laylita I love your recipes, and you make in very simple way than doesn’t require for a chef trying to make any of your dishes. Thanks for sharing your culinary treats .CONGRATS YOUR ARE THE BEST. I did this today. My kids loved it! Love this, my exhusbands Tia would make a version of this called, Ahi ? just the onions and spcies and lime juice and we would use it almost as a salsa to top on all of our foods. I adore Ecuadorian food, fresh and tasty. Cuando leo tus recetas y veo esas fotos se me hace agua la boca jajaja… me encanta tu página web. En South West Florida tienes una fan. I love this! we call this “salsa” and we eat it with everything, its on the table with fish, beef, poultry anything! Thank you for posting these recipes. 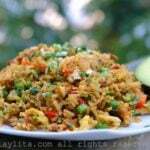 My husband is from Ecuador and I like to provide Ecuadorian foods for our children. I have already made the Green dumpling soup and today, llapingachos. There are so many recipes here and I will be making most of them. Thanks again. Been to Ecuador 2 times, for a total of 10 weeks and can recall all of the local bowls of hot sauce, not knowing how long they had been on the table which did not matter. I always piled it on. Thanks for the great recipes. I remember eating the chancho from a corner market every morning for breakfast with some papas. We spent most of our time in the Tena and Baeza area sampling the rivers in our kayaks. I would love to return to my favorite Latin american country. Thanks for a quality blog. Hi Rachel – I couldn’t imagine making this without lime juice and salt, thank you for stopping by! it makes me very happy to see not only this beautiful recipe, but to see that you are using salt and lime juice to make the curtido and allowing the natural lactic acids bring out the flavors. i much prefer this over using white vinegar. it’s just gorgeous!